Image: Christopher Penn/Flickr//Original photo was cropped but not altered for this article. Grilling season is here, and is there anything better than juicy, flavorful grilled chicken? This healthier choice is loved by pretty much everyone, but sometimes making great grilled chicken is trickier than it seems. 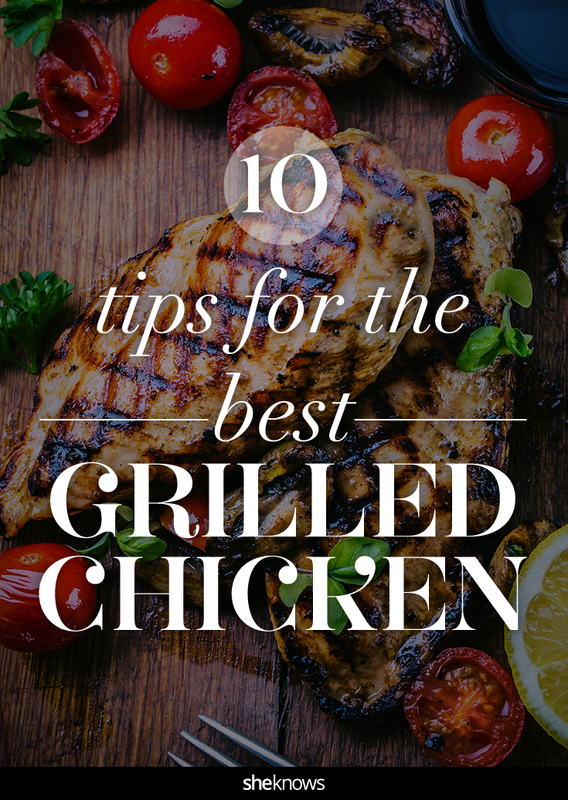 Luckily, thanks to these tips, you’ll never suffer through dry chicken from the grill again. Grilled chicken, especially boneless, skinless breast, benefits greatly from a brine. The salt in the water rearranges the proteins in the meat, allowing it to retain more water, so it stays juicy when on the grill. The general brine recipe is 1 tablespoon salt and 1 tablespoon sugar for every 1 cup of water. You can also add herbs and spices if you desire. But don’t brine your chicken for too long, or it might get rubbery — 2 to 3 hours brining in the fridge should do. Boneless, skinless chicken breasts tend to get thinner on the sides with a big hump in the middle. This can cause them to cook unevenly, leaving the edges, top and bottom dry by the time the inside is cooked through. Place your chicken breasts in between two pieces of parchment paper or plastic wrap and pound them until they are evenly thick. This way, they’ll cook evenly and more quickly on the grill. If you’re making kebabs, it’s important to keep your chicken chunks the same size. Try to make the chunks around 1 1/2 inches each, and when you thread the skewer, make each piece of meat touch the one next to it. This will ensure that when the skewers are on the grill, these small pieces of chicken won’t overcook. Chicken breast is a favorite, but don’t turn down your nose at dark meat. These days, it’s just as easy to find boneless, skinless chicken thighs, and sometimes you can find boneless legs, too. Dark meat chicken is more flavorful, and because it contains more connective tissue, it gets juicier than chicken breast when you cook it. Saucy grilled chicken is delicious, but if you put the sauce on too soon, it can burn. Instead, you should marinate or brine your chicken, scrape off any excess marinade, then grill as usual. A few minutes before the chicken is done, start basting it with sauce, turning the meat frequently until it’s cooked through. A dirty grill does not give you more flavorful food, no matter what you might hear. Chicken tends to stick to all those burned-on bits, so for best results, clean your grill before you start cooking. Once your grill grate is scraped clean, use a pair of tongs to wipe a lightly oiled piece of paper towel over the grate to keep things from sticking. It’s always a good idea to use two-zone cooking when you grill. If you have a multi-burner gas grill, it’s easy: keep one burner hot and the other on low. With charcoal, build a bigger bed of coals on one side and a smaller one on the other. This way, if your chicken starts to get too dark before it’s done, you can move it to the cooler side of the grill to finish cooking. Keeping your grill covered is the best way to keep your chicken moist. Closing the cover will trap the heat in the grill so your meat cooks from all sides. This will help it cook faster, meaning that there’s less chance it will get dry. The best way to tell if chicken is done is by checking its internal temperature. Sometimes the outside might look done, but you’ve still got pink chicken within. Use a probe thermometer to make sure the meat is 165 degrees Fahrenheit before you remove it from the grill. Remember, if it’s not quite there yet, you can move the chicken from the hot part of the grill to the cooler part to finish cooking. Whenever you’re cooking chicken, it’s important to remain vigilant about cross-contamination. For instance, if you use your tongs to place the raw chicken on the grill, make sure you wash them or use a different pair to touch the cooked chicken. Wash your hands every time you’ve touched raw chicken or any plate or tool that’s touched raw chicken. Likewise, don’t place cooked chicken on the same plate or platter that your raw chicken was on. 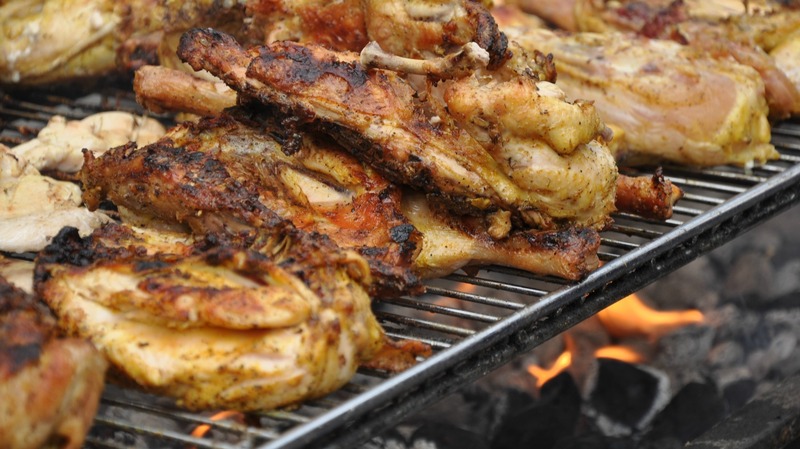 By taking care to make sure nothing comes in contact with raw chicken, you’ll ensure that everyone has a safe and fun barbecue.